These biscuits are the BEST and EASIEST biscuits I have ever made!! No kidding! 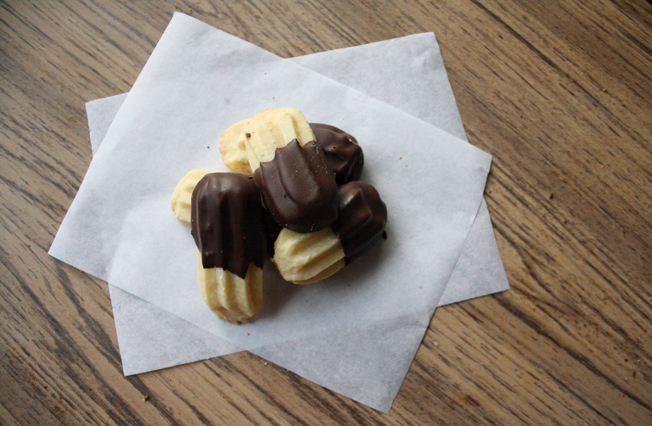 These Viennese fingers just melt in your mouth, and with the chocolate coating, oh my, they are absolutely beautiful!! 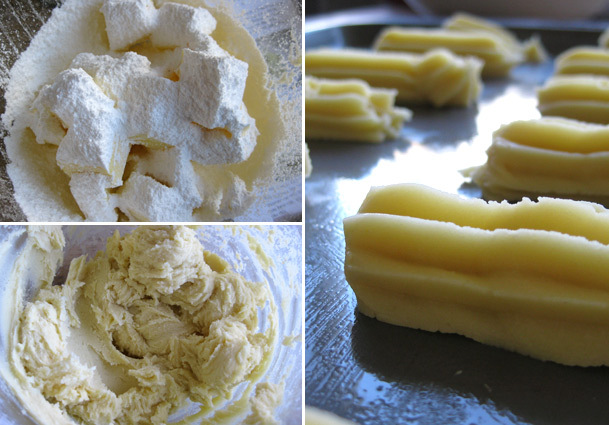 All you need to do is to cream the butter and sugar together and mix the flour in. Pipe them out, bake them, dip them in melted chocolate! Using a wooden spoon or electric cream butter and icing sugar until it is pale and fluffy. Add in flour and corn flour and mix with a wooden spoon until mixture is combined. Now mix vanilla essence in with the biscuits dough. Bake the biscuits at 170°c for 15-18 minutes until lightly golden brown. Then place them onto a wire rack to cool to room temperature. 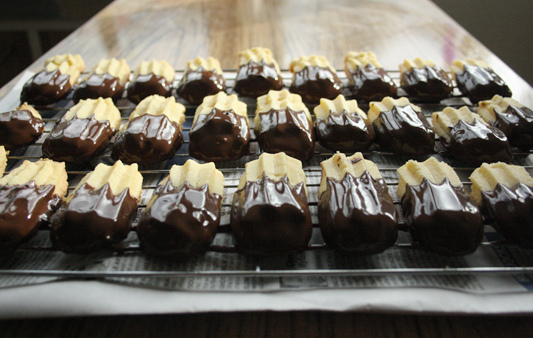 Melt the chocolate and dip one third of the cooled biscuit into it to coat. Leave the chocolate to set completely. My biscuits were a bit under done at the 15 minute mark, so I left them for another 2-3 mins and there they were – perfect! The biscuits were still quite soft at this point, but don’t picnic, they will firm up as they cool down. For presentation, I dipped half the biscuit into the melted chocolate, but next time I am gonna dip the biscuits side way so I get to have the chocolatey goodness for every bite of the biscuit! 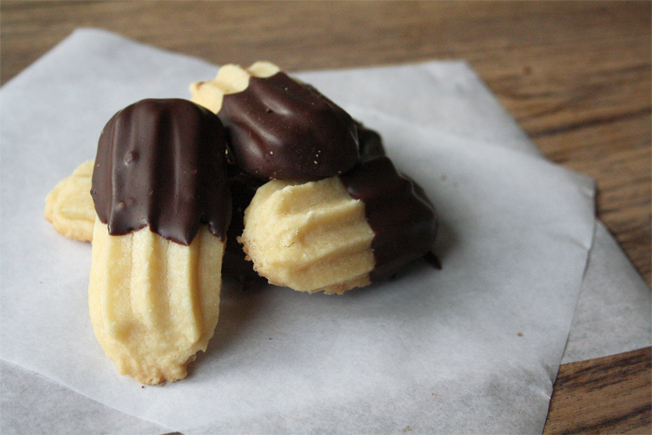 I used an oversize tip (about 25mm big) to pip out the Viennese fingers for about 6cm long. These are the best. But stick them together with some jam. Double happiness! These were so good I ate about 10 in a row! These cute little babies are baking in my oven right now. I tinted them pink, gonna show off on my blog in a few minutes, I’ll give you a track back when I do. Thanks leemz! I am so glad you like them! They are one of my favourite biscuits to bake too! so easy and so delicious!! Definitely give my ping when your post is up, I cant wait to see it! I found your recipe earlier and made them straight away! These biscuits are fantastic, eaten half already. Thanks for posting the recipe. Thank you so much for this recipe as I have been searching for it for years. I am Italian American and grew up in New York, and we would buy these for special occasions at Italian bakeries. I always thought it was an Italian buscuit thus, my trouble in locating the recipe. I baked these immediately and they were phenomenal. They were even better the next morning as they softened and almost melted in my mouth with each bite. I sandwiched mine with seedless rapberry jam and then dipped them in chocolate. I’m so glad you like this recipe!! I love sandwiching mine with jam too! These biscuits are so easy to make, definitely my go to recipe for those special occasion! Enjoy yours! I made these and mine turned out flat! They tasted great though. Did you refrigerate the dough before piping them out? Thanks for trying put this recipe and I’m sorry they didn’t puff up as they should! I don’t usually refrigerate my dough before piping as they are quite firm already. Was ur dough runny or soft? It should be quite firm n stiff and able able to hold its shape. I hope you get a chance to try it again, I’m sure they will turn out better next time! Hello I am from USA and wondering is corn flour like gritty cornmeal or smooth cornstarch or something different all together? Hi there Amy! You can use smooth cornstarch instead of corn flour 🙂 hope you will like this recipe! Thanks! FINALLY FOUND THIS been looking for those for ages! Thanx for sharing was wondering how wud u rearrange the ingredients it ur planning to make cocoa flavored Viennese Fingers any idea? Hi Arwa, so glad you like the post! I havent made a chocolate version of this biscuits before but maybe you can try adding 2-3 tablespoon or 1/4 cup of cocoa powder to the biscuits dough. If the dough gets too stiff you can try adding a bit of milk at the time. But not too much as it should still have a firm dough consistency. Good luck and let me know how you go! They look delicious! Can’t wait to try them later!